The Alfa Laval 3-in-1 yeast handling system lets you do yeast rehydration, yeast propagation, store and re-use yeast strains in a single unit. Let our 3-in-1 yeast handling system help you with your yeast management so you are able to control your own yeast strains and become more independent from yeast suppliers. Pitch wort with high viability and high vitality yeast. Increase your beer range by using different yeast strains. Easy to install as the yeast management module is pre-assembled, self-contained and tested before delivery. Our yeast management system is designed for craft breweries. The system is based on our extensive experience from yeast management and can be fully tailored to your needs all the way from yeast propagation and yeast rehydration to yeast storage. The module is compact and fully automated for easy use. It performs yeast concentration of 100-150 Mcells/ during a propagation time of 48-96 hours. 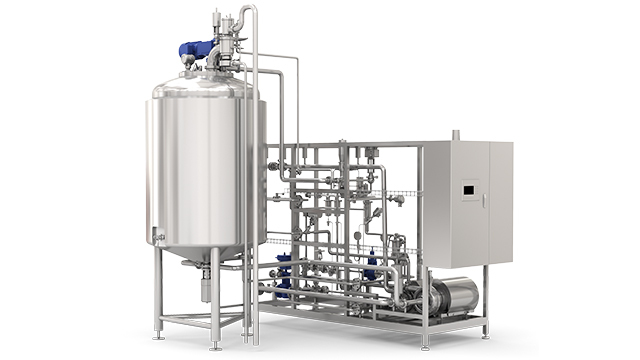 The 3-in-1 yeast handling system handles batch sizes from 5 hl (4.3 bbl). The vessel is first filled with cold or hot wort. (Or if you like, sterilize the wort using a steam jacket added into the cone.) As the wort is cooled the propagating yeast is then injected into the vessel through the sample valve by a Carlsberg flask. Controlled aeration of the temperature controlled wort takes place during yeast propagation. The yeast propagation process normally runs until the end of the exponential growth phase. When rehydrating there is added dried or pressed yeast into the vessel through the top plate opening. The yeast is then suspended in the wort or water, and aerated if needed. The fast process normally takes less than 2 hours, depending on whether aeration is required. Once completed, the rehydrated or propagated yeast will be ready for fermentation. homogenization and decarbonization to ensure a high degree of yeast viability and vitality between fermentations. Aeration can be performed prior to pitching if required. Read our product brochure to learn more about this product's application, working principle, benefits and technical details. Our dedicated team looks forward to assisting you and discussing in details about this yeast management module in the brewing process.